Denis Darzacq, Hyper No.7, 2007, color photograph, 50 x 40“. From the series ”Hyper," 2007. The suspended figures that leap, fall, twist, lean, and float in Denis Darzacq’s photographs were not, as one would suspect in a digital era, created on a blue screen; they were captured en marche the old-fashioned way, on location. Since 2005, Darzacq has invited young dancers from working-class neighborhoods in Paris, the city where he lives and works, to participate in his work; the results of this collaborative, performance-based process are infused with the beauty of dance and sociopolitical subtext. 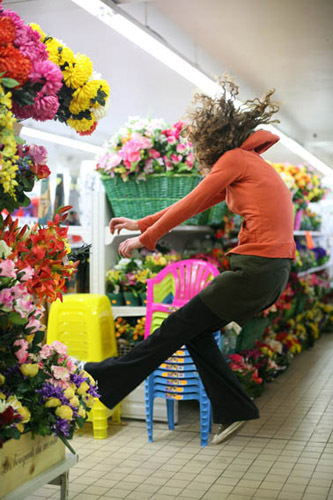 Included in this exhibition are works from two series: “La Chute,” 2005–2006, shot in and around Paris shortly after the riots of that year, and “Hyper,” 2007, featuring more closely cropped figures eerily floating through the colorful aisles of modern supermarkets. The first series focuses as much on a gritty urban locale as on the lone incongruous figures hovering in its midst; in both content and dystopic sensibility, these images recall Robert Longo’s drawings of falling individuals from the 1980s, cool and controlled evocations of some mysterious menace. The images in “Hyper,” photographed in the massive supermarkets that have replaced quaint shops in Paris—and in cities the world over—glow with the sickly fluorescent glare and synthetic hues of convenience stores everywhere. Though compositionally elegant, the pictures in “La Chute,” close to the protests in time and space, mirror the anxiety and injustice that lead to civil unrest; it is the candy-colored malaise and disassociated anomie of “Hyper” that get at the demon behind the discontent, shining an antiseptic light on the multiplying tentacles of global capitalism.